Costco Flyer 26 July 2016 provides a healthy life for your all family. Costco Flyer products on sale until end of this week. Check Costco Flyer and rewrite your shopping list immediately because Costco offers looks fantastic. Do not forget to use your Omega-3 Tablets. If you are pregnant, you have to use these tablets for your baby. Because there isnt any minimum age for this supply. Even for babies, you can use it. Lets go outside with Costco products. Doesnt matter age or gender. Everybody playing Pokémon GO ! You need a phone and powerbank for sure but long run distances you need comfortable wears too. For perfect sleeping experience, you can use these pillows right now. You will realize real comfort and luxury life. As you know, choosing right pillow truly affect the way that you go about your day. If you are lying flat on your backs you should choose a flat and thin pillow for great feeling. Come to Costco Store and enjoy your shopping. Are you trying to reach your goal of body shape ? Its not enough if you are just trying to eat carefully also you have to careful your beverages. st. Pellegrino mineral water helps to lose weight and keep you healthy. If you are stressful, it can balance your lower blood pressure. 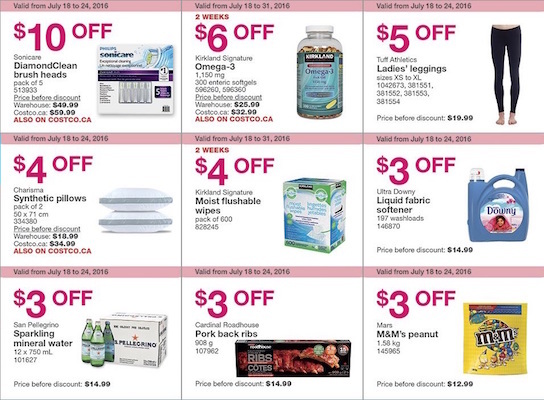 Keep checking Costco Flyer 26 July 2016 for good deals.